As part of their ongoing project to revisit some of the most iconic films from their back-catalogue by releasing a series of acclaimed and influential films on Blu-ray with unique special features and accompanying booklets. 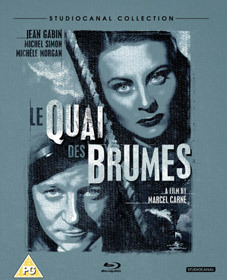 In the latest collection, due in September, will consist of Orson Welles' The Trial, Luis Buñuel's That Obscure Object of Desire and Marcel Carné's Le Quai des Brumes. 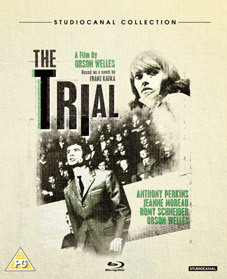 Based on the influential Franz Kafka novel, The Trial is a paranoid masterpiece directed by Orson Welles and starring Anthony Perkins, Jeanne Moreau, Romy Schneider, Orson Welles and Akim Tamiroff. Josef K (Perkins) is arrested, but has no idea what crime he is accused of. In order to find out what offence he is meant to have committed, and to protest his innocence, Josef K must go through the machinations of the judicial system, but he soon finds himself trapped in a dehumanised nightmare. Booklet on the movie written by Jonathan Rosenbaum, film critic and author of Discovering Orson Welles (2007), the editor of This Is Orson Welles (1998) and consultant on the 1998 re-edit of Touch Of Evil. Adapted from Pierre Louÿs' 1898 novel La Femme et le Pantin, That Obscure Object of Desire proved to be Luis Buñuel's final film. Recounted in flashback to a group of railway travellers, the story wryly details the romantic perils of Mathieu (Buñuel favourite Fernando Rey), a wealthy middle-aged French sophisticate who falls desperately in love with his 19-year-old former chambermaid Conchita (Carole Bouquet). Thus begins a surreal game of sexual cat-and-mouse, with Mathieu obsessively attempting to win the girl's affections as she manipulates his carnal desires, each vying to gain absolute control of the other. A Portrait if Luis Buñuel (interview with Pierre Lary and Edmond Richard). Booklet on the movie written by Ginette Vincendeau. The Trial, That Obscure Object of Desire and Le Quai des Brumes will be released individually on UK Blu-ray by StudioCanal on 3rd September 2012 as part of The StudioCanal Collection at the RRP of £24.99 each.